"Ba-Souto mission area based on information provided by the missionaries of the Society of Evangelical Missions of Paris." [English: Ba-Souto mission area based on information provided by the missionaries of the Society of Evangelical Missions of Paris.]" "[original caption] Mission du Pays des Ba-Souto d'après les renseignements fournis par les missionaires de la Société des Missions évangéliques de Paris." Title: "Ba-Souto mission area based on information provided by the missionaries of the Society of Evangelical Missions of Paris." 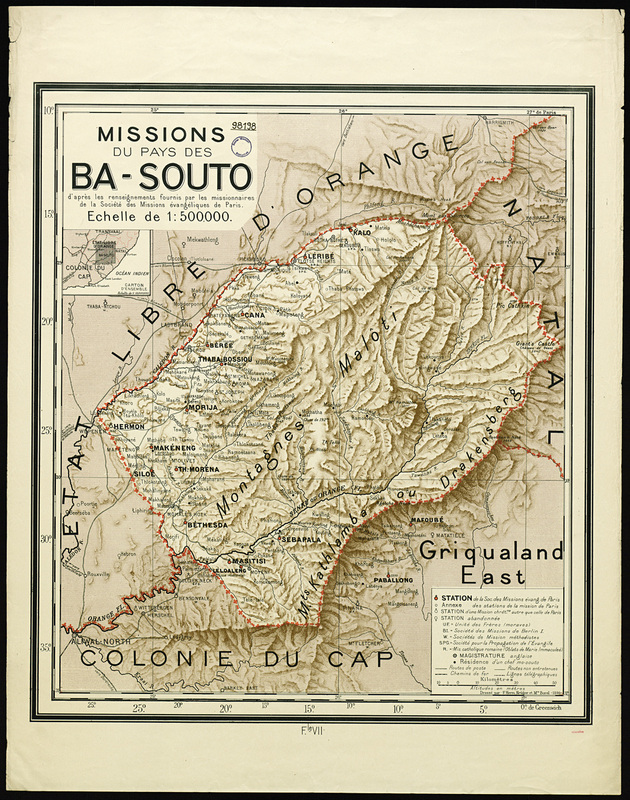 “Ba-Souto mission area based on information provided by the missionaries of the Society of Evangelical Missions of Paris.,” BMArchives, accessed April 23, 2019, http://www.bmarchives.org/items/show/100203045.